Hi, I’m interested in Dell Vostro 1540 laptop. Please contact me. Thanks! You will only receive the laptop battery and charger. All laptops were sent back to their manufacturers, just to make sure the machines are in working order with no bump, cracks or scratches. Machines are brand new. Dell Vostro 15 – 5568 + Dual-Graphics + Full HD IPS Display + Full Aluminium Chassis + HD Audio. Software: Windows 10 Professional 64bit, Office Professional Plus 2016, Security Essentials, Adobe Acrobat Reader, Mozilla Firefox, Opera Internet Explorer, Skype, VIc Media Player, K-Lite codec Pack — Latest. 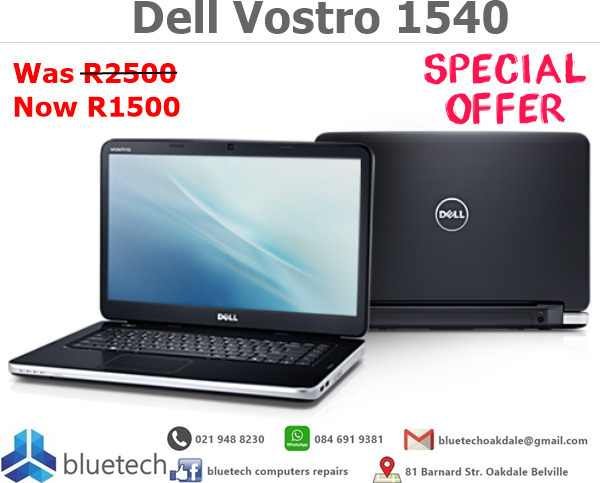 Dell Vostro 15 – 5568 + Full HD IPS Display + SSD Drive + Full Aluminium Chassis + HD Audio. Current retail is just under R20k, Please see pictures attached for retail.